Looking for more ideas on how to spend your days while you visit Paris? You must download our Free 4-Day Paris Itinerary! Shopping at a Paris street market is a wonderful French tradition that have faithfully withstood the take-over of huge supermarket chains. Unlike your local ‘Carrefour’, they are full of character, colour and best of all, amazing local produce. Paris is host to many markets that come in all shapes, sizes, and specialise in all different types of produce, bric and brac, antiques.. you name it, they have it, so whatever you’re looking for, there is something for you. We’ve created this guide to the best street market in Paris in hopes that it’ll offer you a different but fun experience on your trip! Marche Aligre is a hub of bustling activity selling a vast range of affordable produce 6 days a week! The outdoor food stalls that fill Place d’Aligre are open from 9am-12:30pm, but come afternoon, the streets are swept and the market is cleared. But the market shopping fun doesn’t stop there as the covered market, right next door is open during the afternoon from 4- 7:30 pm. Whilst the prices in the indoor market are more expensive, you can find some delicious and unusual treats, including wild game, craft beer and even horse meat! Pommier- located just inside the entrance to the covered market at Place d’Aligre, this beer shop sells a great selection of Belgian, German and French craft beer at very affordable prices. One of the largest food markets in Paris, the food stalls that make up this market sprawl up Boulevard Richard Lenoir every Thursday and Sunday displaying an impressive array of fresh fruit and vegetables, exotic spices, French local cheeses, butchers selling free range chicken and fresh fish and much more, making any weekly shopping trip to this market a joy rather than a bore. Literally translated as the market of the red children, this hidden maze of a market is named after a neighbouring hospice for orphans who wore a red uniform. Today, the market often goes unbeknown to passers-by, but to those who have scouted out this ancient gem (and dating way back to 1628, It is indeed ancient), it quickly becomes a favourite spot to stop and grab a bite to eat if you’re in the Marais area. The market is full of food stalls selling amazing fresh dishes from all around the world so you can peruse the busy stalls and decide whether you fancy a traditional bistro, Moroccan couscous, fish and chips, organic soup or fusion Japanese… all without leaving the market. More than 50 traders come to sell their bio produce every Thursday, Friday and Saturday at the marche des Batignolles. And it’s not just vibrant bio fruit and veg that fill the markets, bio cheeses, wines, jams and much more are invited to this bio party! Enjoy strolling through the vendors stalls to pick out some tasty bio treats for yourself. 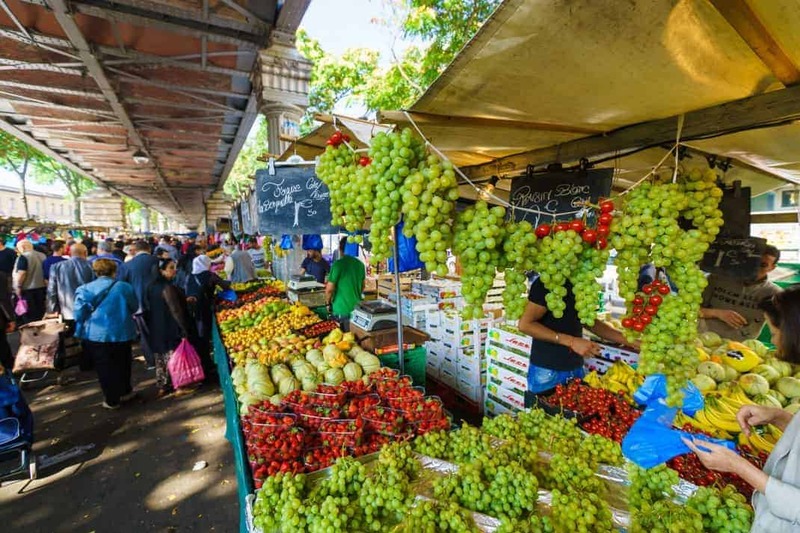 The marche Raspail is the biggest and most impressive bio market in Paris. Stretching from rue Cherche-Midi to rue de Rennes on the left bank, it brings a certain chic flare to the market shopping experience. Unsurprisingly, you aren’t going to bag yourself a bargain at this market, but you know what you buy will be of top quality. With more than 2500 stalls grouped together in 15 different market spaces, covering 7 hectares, you can easily spend a whole day exploring this unique market. If you want to experience the market in its entirety, you will experience its changing and evolving nature as you walk around. You’ll find some rough-around-the-edges stalls where you can find some hidden gems! You’ll also find a world of upmarket antique stalls of prized ancient objects creating an almost museum type of ambiance. This market is the biggest in Europe! It’s certainly a far cry from the touristy side of Paris, but it can be hugely fun and you are guaranteed to leave with some interesting and unique finds! This Paris street market is the perfect sunny weekend activity! To Plan for your visit there read Paris Flea Market guide.